It’s been about ten months since the release of Windows 10 and millions of Windows 7 and Windows 8.1 users have upgraded their PCs to the newest version of Windows using the free upgrade program from Microsoft. The free upgrade program will be available for the next couple of weeks, meaning users who want to upgrade their Windows 7 and Windows 8 PCs to Windows 10 should upgrade to Windows 10 before July 29th, 2016 in order to avail the free upgrade. While hundreds of millions of PC users upgraded to Windows 10, an equal number of users don’t want to upgrade to Windows 10, at least for now. Users have been complaining since the release of Windows 10 that Microsoft is forcing users to upgrade to Windows 10. Some are even claiming their PCs were upgraded to Windows 10 without their consent. If you’re happy with Windows 7 and don’t want to upgrade to Windows 10, you will be happy that finally there is an official way to stop Windows 7 PCs from upgrading to Windows 10. Microsoft recently an update to Windows 7 which adds a new policy that allows you block upgrades to the newest version of Windows through Windows Update. In short, once you install the update and enable the policy either in Group Policy or Registry, Microsoft won’t be able to upgrade your Windows 7 PC to Windows 10 without your knowledge. To block Windows 10 upgrade on your Windows 7 PC, please complete the given below directions. Step 2: Run the downloaded update file to install the same. If you’re asked to restart your PC, please do the same to complete the installation. Step 3: Once done, open Group Policy editor by typing Gpedit.msc in Start menu search box and then pressing Enter key. IMPORTANT: Note that Group Policy editor is not present in Starter, Home Basic and Home Premium editions. If you’re on one of these editions of Windows 7, please refer to the instructions mentioned in Step 6, 7, 8, 9 and 10. 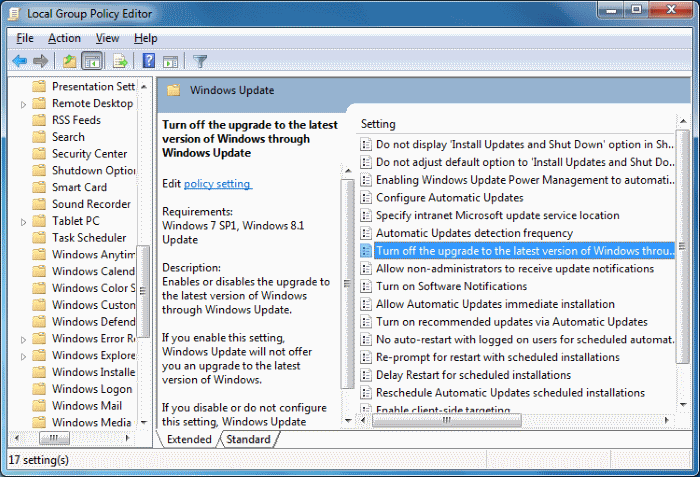 Step 5: On the right-side, look for the policy named Turn off the upgrade to the latest version of Windows through Windows Update. Double-click on the policy to open its properties, select Enabled and then click Apply button. That’s it! 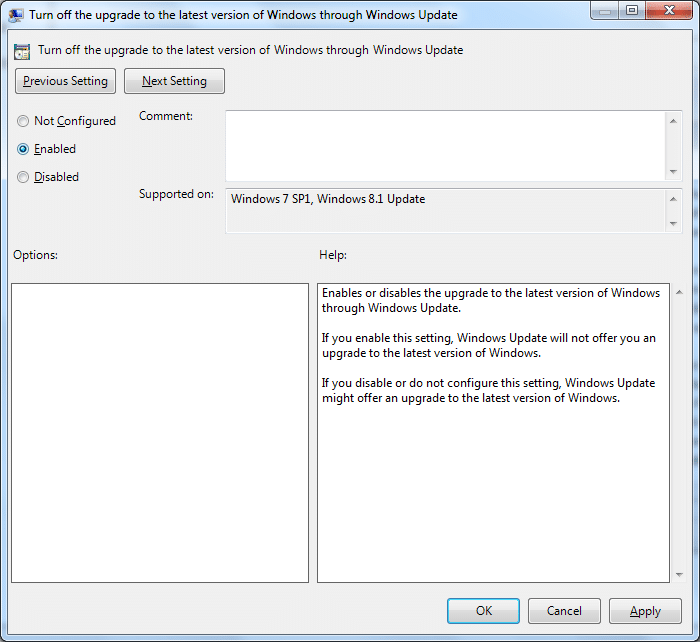 Your Windows 7 will not be upgraded to Windows 10 via Windows Update unless you change this policy. Step 6: If you’re on Windows 7 Starter, Home Basic or Home Premium edition, open the Registry Editor by typing Regedit in Start menu search box and then pressing Enter key. 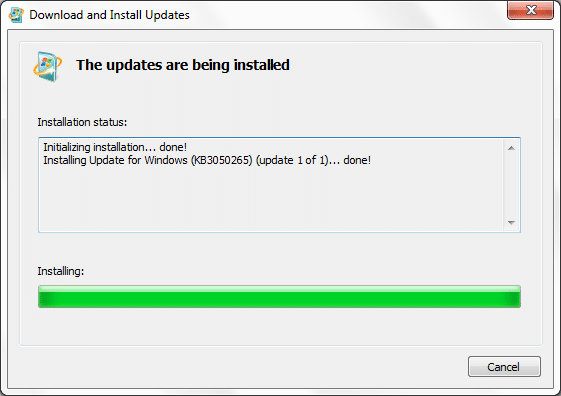 Step 8: Under Windows key, check if there is a key called WindowsUpdate. If not, create a new key and name it as WindowsUpdate. To create a new key, simply right-click on Windows key, click New and then click Key. 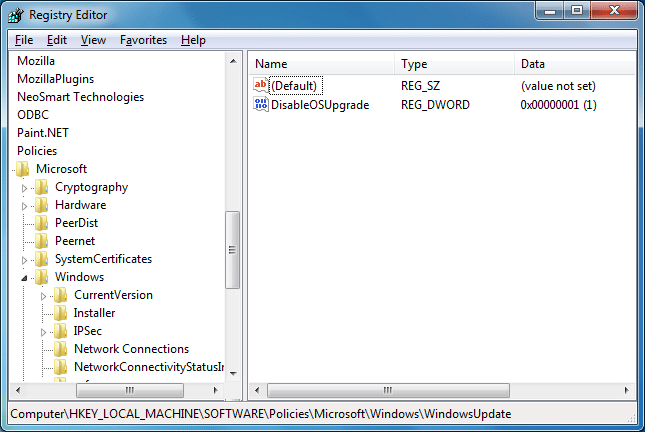 Step 9: Click on the newly created WindowsUpdate key. 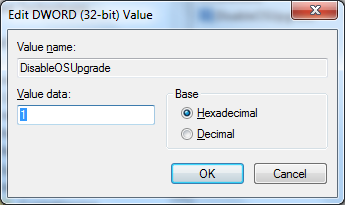 On the right-side, create a new DWORD value (32-bit) and name it as DisableOSUpgrade. Step 10: Finally, double-click on DisableOSUpgrade value and set its data value to 1 in order to stop your Windows 7 from upgrading to Windows 10. Why on earth does this article babble on about messing with poledit or gpedit or whatever when a link to a 50byte MYOB_Dollarsoft.reg file would have done the job automatically for everyone, regardless of which version of windows they’re lumbered with? – A side note about another .reg to re-enable the /real/ administrator account and they can even be forever done with clicking the ‘yes I really do want to change my socks’ ACL boxes that pop up at any excuse.